Sick wrote: Ooooooo comrade... I think if Manumua and Simionescu feel like playing... you are in deep **** even in Norlisk. It is likely that in coming years we (Russia, Romania, Georgia, Germany) will be thrown out of Challenge Cup. After removing a player Timisoara has no chance. Too big of a skill and talent gap between some Timisoara players and the rest. Ooh, I've been waiting for the possibility of this confrontation for the past 4 years. And finally, I can't say I'm disappointed!! Yenisei is now rejuvenating team. Time for this is chosen very well! luca tim wrote: Ooh, I've been waiting for the possibility of this confrontation for the past 4 years. And finally, I can't say I'm disappointed!! An extra player in such a game is a very big adantage. I think that in equal teams Enisey would not have won. Incredible end. Congratulations to Timisoara, the score is harsh and the red card probably costed them the qualification. If we take into account the loss of half of the main players, then Enisei was very lucky. Morozov, Polivalov, Krasilnik, Rudoy, Orlov and Kushnaryov left to other clubs. Injured Gargalik, Simplikiewicz and Budichenko. Until the fall there will be time to create a new team. STMKY wrote: If we take into account the loss of half of the main players, then Enisei was very lucky. Morozov, Polivalov, Krasilnik, Rudoy, Orlov and Kushnaryov left to other clubs. Injured Gargalik, Simplikiewicz and Budichenko. Until the fall there will be time to create a new team. Timisoara have a sizeable list of injuries as well (Lemnaru, Fercu, Umaga, Conache, Rose) which forced the staff to start with only 2 backs on the bench and also lost players. 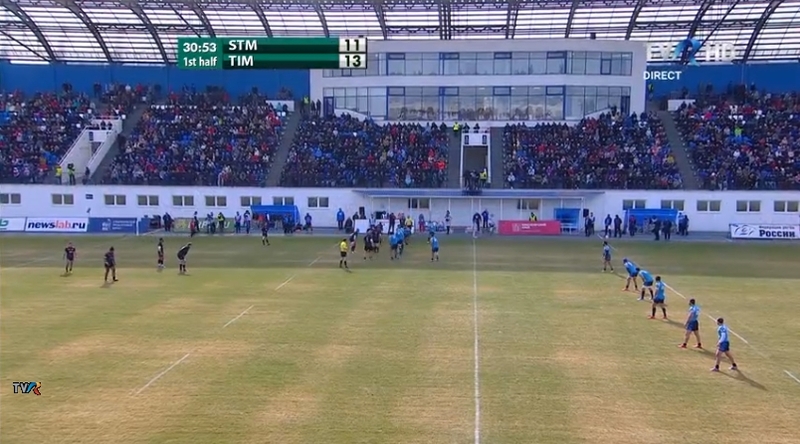 I think what is worrying for Enisey and Russia was that I only noticed Georgians in the team while Timisoara's kindergarten kind of made all the tries. Too bad of that red. Good luck in Challenge Cup! amz wrote: Timisoara have a sizeable list of injuries as well (Lemnaru, Fercu, Umaga, Conache, Rose) which forced the staff to start with only 2 backs on the bench and also lost players. I think what is worrying for Enisey and Russia was that I only noticed Georgians in the team while Timisoara's kindergarten kind of made all the tries. Too bad of that red. Good luck in Challenge Cup! Thanks. I think that the matches of Enisei and Timisoara showed the need to create an international league with the participation of clubs from Russia, Romania, Georgia, maybe Italy and Germany. Especially considering that the Continental Shield will no longer exist. The Challenge Cup is closed for all of us. Today Morariu was in Kaliningrad. 10,000 spectators at the final of EuroChampU18. I think he liked it in Russia. And he will lobby this international league. Beka Tsiklauri from Locomotive is the best scorer of this edition of Continental Shield with 55 points, three more than Calvisano's young flyhalf Pescetto and around twenty more than Rovigo's substitute flyhalf Piero Dominguez (son of Diego).